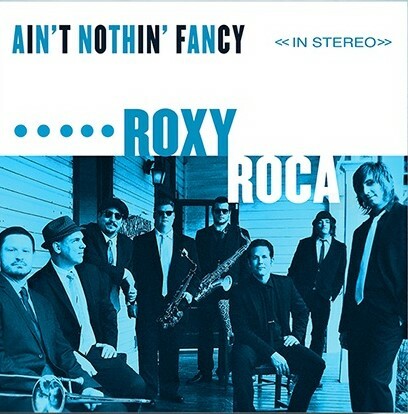 The other day I was emailed about this Austin-based soul band called Roxy Roca. They may not be big yet, but have been making waves in the south eastern states with performances at SXSW, Alabama BayFest, Rhymes and Vines, Old Settlers Music Festival and Art Outside. Their sound is refreshing in this age of computer-generated music. It is lively, natural and lead by a singer with a rough, hearty voice while being backed up by a classical and energetic brass band. “ROXY ROCA is a modern day soul band that is clearly influenced by legends like James Brown, Otis Redding, and Little Richard. The music definitely inspires dancing and you can expect song after song of fun tracks that were made to dance to! The title track “Ain’t Nothin’ Fancy” starts out like “We Will Rock You” by Queen. It then progresses into a deep soul song. ROXY ROCA’s music brings back an era of soul that isn’t appreciated much anymore so it’s nice to see them bring it back! Their album, Ain’t Nothin’ Fancy is released tomorrow (24th Feb) and is available digitally, on CD and vinyl through Stag Records. I would say it is definitely worth a listen! Part of the ‘Supporting Creation’ programme. To see how we can support your work, click here.